A happening by chance is often a wonderful thing. I came to know of Anton and Olivia by such pure chance, and its futile to mention, but I’ll still do, that I was instantly intrigued and inspired. Their world had beauty, both obvious and subliminal for me to indulge in, and unearth further. Conversations started on a simply inquisitive basis. Before I knew, the inspiration for my next collection was in front of me. For all the bare, natural, and organic lifestyle of theirs that pulled me towards them, it’s ironic that we met virtually first, thanks to the internet. This collection, the designs, the ethos, and even the names of the clothes in one way or the other are inspired by them. I met Anton & Olivia in the early part of 2016. That time I had little idea of what I was going to do exactly, how it would be done, what it would be made up of. But I knew I really wanted to do a collection based on them. 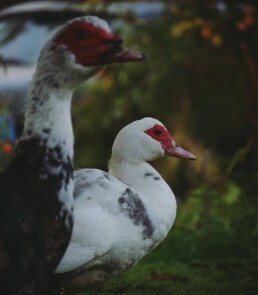 I began by gaining an insight into their life story. Where they came from to where they live now, where did they grow up, their history, their ancestors, families, their current life, what inspires them, what does not, and much more. It was key for me to try and watch a film in my head based on their life so far. And so, really long email conversations ensued. I would read these emails over and over again, print them and stick onto the wall by my bed-side. Lots of sticky notes on the other. Once I felt I knew a good bit about them to work with, I started picking out keywords. Two such keywords that stood out for me for example were ‘Attachment’ and ‘Freedom’. They are attached to certain set of values, beliefs, the land they live on, and yet, they are free from a number of worldly attachments that many of us cannot do without. Soon the keywords started to take shape of designs. Attachment and Freedom turned to pleats in fabric, symbolising the extra fabric ‘attached’ on clothing to create a pleat, and the pleat in turn providing ‘freedom’ of movement when one wears the garment. The idea of deep and wide pockets in one of the jackets stems from their habit of foraging berries and fruits and collecting them in the pockets of the jackets during their walks through the forest and gardens. Similarly I put a button at the bottom hem of one of the super wide leg trousers to make sure they could gather it and tuck it if needed during such walks through the tall grass, or while working in their back yard with the animals. They love to partake 15th century re-enactment events and live there in beautiful costumes, set of like-minded friends, carry out the chores, cook food, make music and craft things and objects as people did back then. To me it reflected their love for old times, and firm belief in the slow pace of life where each moment is treasured and cherished. This inspired one of the long shirts with a buta shaped collar. Anton stands in it with some beautiful wooden bowls he made, among other things that come out of his love for whittling. A man with long hair tied into a hanging bun, a newspaper boy hat atop, sitting with his dog at the edge of a pier overlooking the archipelagos, a cane basket lays beside him.Anton wrote to me for the first time during the summers. Till this point, all the communication in letters was mainly with Olivia. 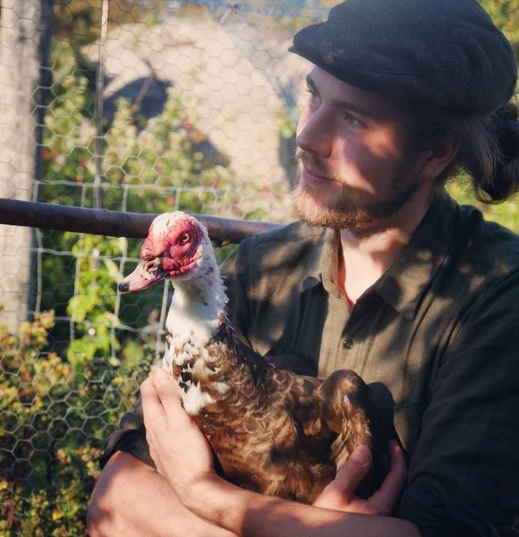 That time of the year kept both of them super busy with the garden – planting new seedlings, finding out what the new harvest has to offer, and sprucing the current crop. 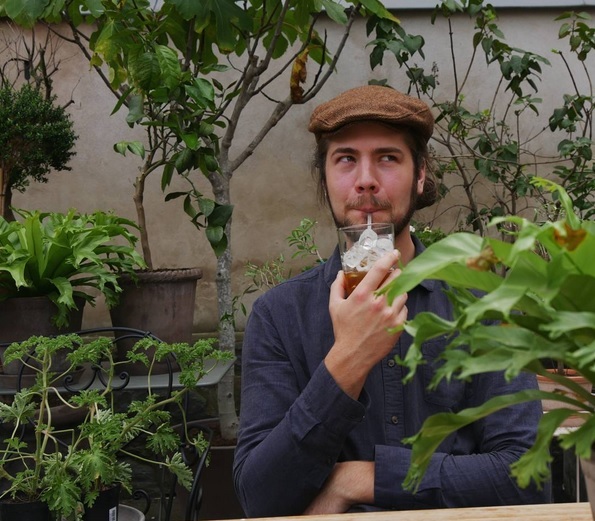 So this tall guy with an angelic face playing around with his animals in the backyard, and randomly stopping on walks through the woods and sniffing tea leaves that most of us do not even know the name of was born on the outskirts of Stockholm. 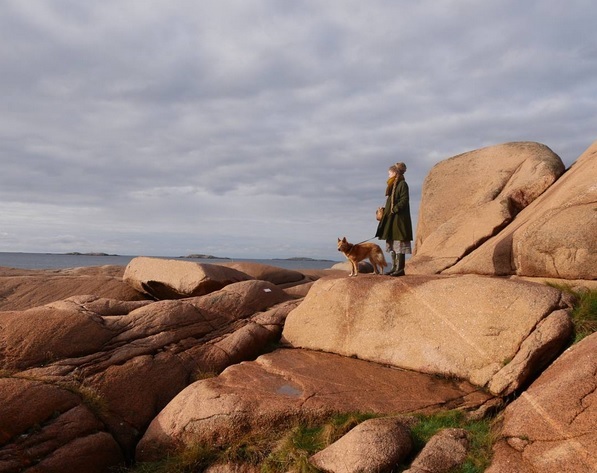 Soon after the family moved to a smaller town, Vimmerby, a town well known for giving the world Pippi Longstockings, Emil i Lönneberga and other stories by author Astrid Lindgren. The town also gave him his very first set of friends, helped him find out his love for the forests, the sea, the coast, and the nature. Years down the line, he moved to the University at Gotland to study archaeology, and it was here that he and Olivia first met. They say that they found love in each other instantly, even unaware that they had almost everything common – interests, life plans, dreams, likes and dis-likes. It was perfect and continues to be so today and hopefully forever. He is a man after the simple pleasures in life – the morning sunshine on the grass in the garden, the special glow on the apples during sunset, the little differences in light and hues, and how it falls on different things in and around the house and make them almost talk. He plans to expand the already sizeable land they have, and live off it along with their beautiful animals. The realisation to the dream has begun, and he knows that too. Its just a matter of time. One of the earliest inspirations for such a life came primarily from his parents, who invested their time lovingly into growing things in the land. 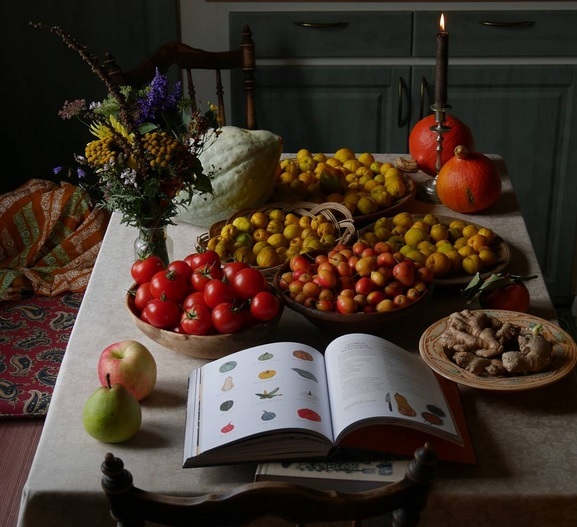 Others include the English River Cottage with Hugh Fearnley Whittingstall, the Danish Camilla Plum at Fuglebjerg Gaard, and the Swedish family of Mandelmann at their fantastic Mandelmanns Trädgårdar in southern Sweden. One key element that comes across as vital, but still missing at large in today’s lifestyle is the pace of life.Slower pace of life and extracting pleasure from each moment spent in doing the things you love is his philosophy. 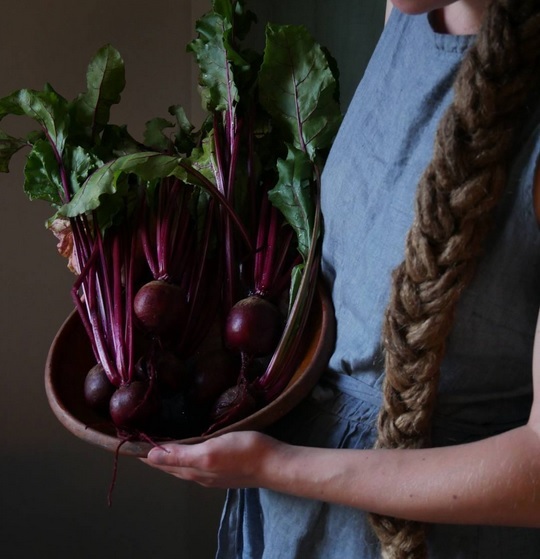 A pair of hands holding a wooden bowl with fresh pickings from the garden, angled from the left of her shoulder, braid of her lovely hair could be seen right at the edge of the frame. I exchanged a few messages of mutual admiration with Olivia over Instagram. It struck me right away how their pictures were what I always have liked pictures to look like. Wordless story, each one of them. Olivia was born in Vanersborg, grew up spending time at her parent’s summer house (where Anton and Olivia now live) on the coast during holidays with friends, and making jams and cordials from everything the seasons had to offer. Early teens were spent in the UAE. Such a drastically different environment provided a new view of life and broadened the intellectual horizon. Back in Sweden years later, studying “antiques” in Visby in order to pursue a career in either an auction house become a museum curator, she met Anton. It was now when her parents were taken seriously ill, that Olivia decided to leave studies incomplete, and rather spend time with her parents. Anton came with her. I think of this as a simple and pure testament to their love. A love this pure is the unicorn of our times. Her parents are both fit as fiddles now. A move back to Visby for both of them was stalled, but a far more beautiful life ensued. 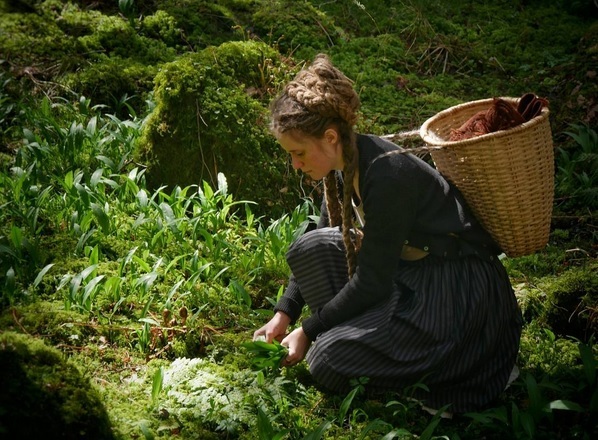 Days are spent now caring for the houses, the gardens, the nature and woods that her grandparents left behind. Ingeborg, Olivia’s paternal grandmother was a seamstress, grower of flowers and a no nonsense lady, strict but loved by all, with a pot of coffee always on the stove for all the people popping in to say hi during the day. If she was still around, she would have approved of these two kids fussing about in her garden. Just like Anton, Olivia dreams of one day owning a larger property that would give them the possibility to keep more animals, grow more food and house a small business venture delving further into their food interests. A small place to cure charcuteries and ideally be able to serve some guests or just sell the surplus of what they manage to produce. Thrift-stores full of antiques, homemade preserves and the gathering/ foraging of them, visiting preserved old interiors, folk costumes in general but Slovak in particular (maternal heritage), good private and public gardens, the first blackbirds that sing in the spring and growing things – are some of the things that make her over-joyous. For he likes to whittle, she likes to forage. 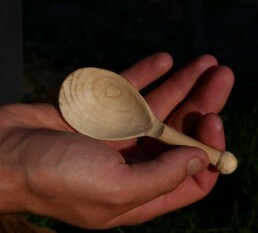 He carves wood and makes things. I sat in their kitchen during the few days of the shoot, and there was hardly anything around that wasn’t made by hands either by them. A collection of beautifully crafted chopping boards, ladles, spoons, and bowls lay atop one of the small tables. Their cellar is a temple of fermentation. On the first evening, Anton proudly poured their first ever attempt on Dandelion wine. Till this point I had only heard the song ‘Dandelion wine’ by one of my favourite musicians, Gregory Alan Isakov. Their lifestyle is so much similar to Gregory’s. Life is extremely busy for these two all year round. Summer starts with a lot of swimming in the sea, coast being a. minute away from the doorstep. It’s time to bring the boat down to the harbour, row, and reach the nearby islands to spend the day in the sun, along with Foxy (The dog, she is a permanent fixture on any visit they take out of the house. The area gets a lot busier, as opposed to about 5-6 people that live in the vicinity of a few miles within their house. Sowing straight into the earth and acclimatizing the new seedlings to the great outdoors and planting them becomes a routine in the warmer days. The two overtly eager kids that they are, then monitor the progress and growth of their plantation obsessively. 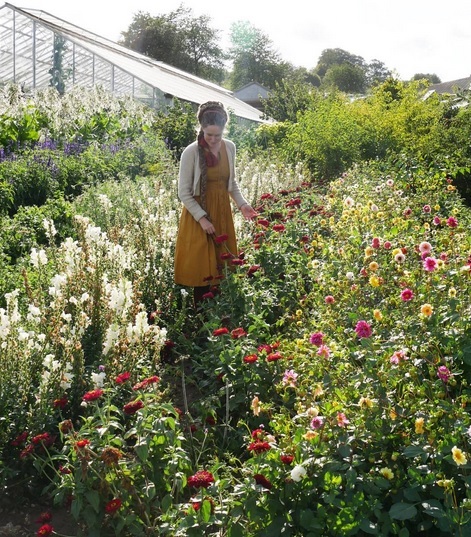 Picking follows – white, black and red currants, sweet and sour cherries, gooseberries, rhubarb, raspberries, plums, elderflowers, wild sea kale, potatoes, zucchinis, garlic and onions, peas, beans, beetroots, and heaps of flowers. 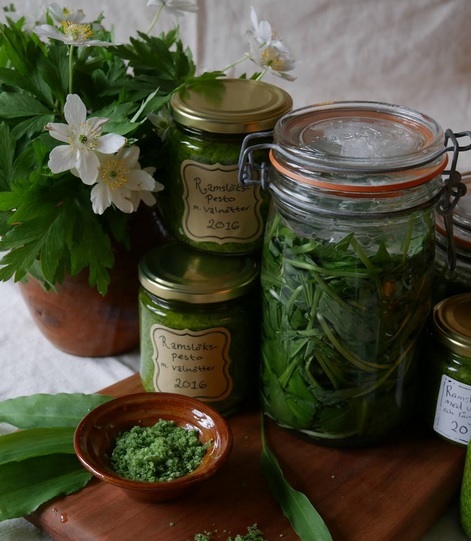 Come autumn, Olivia delves into preserving, pickling and fermenting blackberries, apples, quinces, pears, mushrooms, rosehips, sloes, rowan berries, and heather honey. The season for basically living in the kitchen. Winter beckons feeding the wild birdlife and enjoying looking at them from the kitchen window, tending to the feathery flock and dreaming about spring. Kettle full of tea is placed on the table, around it – a pile of books on growing, harvesting and making things. Just as I write this, the first snow of the season has fallen in Kungshamn, and Anton and Olivia are out walking with Foxy.